Dawn Culp, Dawn Culp is a Meditation Coach in Silicon Valley and a champion of the human spirit. Dawn loves to help people wake up and discover their true potential. The Balance of Doing and Being. Imagine, if you will, that it’s Springtime. You’re looking forward to planting this year’s garden which you have decided will include not only your traditional fruits and vegetables, but various flowers as well. You make a trip to the nursery to choose your seeds or plants and whatever your special cocktail needs might be to create the perfect soil for this year’s crop. Once you are home, you determine the perfect place to plant your garden taking into consideration full sun or partial sun while making sure the right access to the drip system or sprinklers is available. Gardening is a very therapeutic exercise and there’s nothing like eating a tomato off your own vine. I think one of the reasons why gardening is such a grounding and rewarding exercise is because it allows you to be in touch with both your Yin and Yang energy. What the heck is Yin and Yang energy, you might ask? In short, it is the duality that exists within each of us. It is the masculine and the feminine, the Sun and the Moon, the Light and the Shadow — where both are necessary to create the whole. It is believed that having a harmonious balance of Yin and Yang are necessary for well-being, and when Yin or Yang are out of balance they can affect each other, and too much of one can eventually weaken the other. So, again, what the heck does all of that mean? Let’s look at it in more everyday terms. Yang Energy — Masculine, Active, Hard, Hot, Light, Sun. Yang energy likes to go, do, push, “make it happen” and get there quickly. Yang energy is excited, direct, logical and rational. Yin Energy — Feminine, Passive, Soft, Cool, Shade, Moon. Yin energy likes to stop and smell the roses, “sleep on it” and relax and take the scenic route. Yin Energy is sensitive and intuitive, imaginative, relaxed and nurturing. Just reading these very brief descriptions probably has you identifying a little heavier in one direction than the other, and if that’s the case, great! You are ahead of the curve because there is beauty in having a balance of both and knowing where you currently exist so you can nurture the other. Yes, it is important to get things done and execute, execute, execute (Yang) but it’s equally important to make sure you are heading in the right direction while intuitively listening to your guiding queues and/or enjoying yourself along the way (Yin). Certainly, it’s nice to take some downtime and chill (Yin) but we do have to get to work if we want to pay those bills (Yang). If Yang throws the ball, Yin catches it. You can’t have a good game of catch without both sides. You can’t have a full day without the sun and the moon. You need to be active (Yang) as well as rest (Yin). Preparing a garden is a very Yang activity. You choose your plants, you calculate the location based on the sunlight, you dig the hole, you plant the seeds or the roots, you pat out the dirt, you water appropriately and then……. You Wait — and wait — and wait! Waiting is a very Yin activity. Even if you can’t see your carrots growing underground, you give them the benefit of the doubt and trust that they are maturing and on their way to ripening perfectly. You let them be. You know that if you were to dig them up too soon (just to check on their progress) that you’d be interrupting their natural growing process. Even if you use the most powerful fertilizer known to man, you can’t make your tomatoes grow any faster than the Tomato Gods will allow. You wouldn’t plant a rose seed and then dig it up on day 3 just to see how it was doing. You’d trust that the rose seed was doing its thing (assuming you were giving it enough water and sunlight). As that same rose begins to mature down the line and the bud begins to open up, you also know that you can’t force those petals to open any sooner than they naturally should. You allow nature to take its course while enjoying the process. There’s beauty in the unfolding and watching the bud fully bloom. You cannot rush a rose in bloom and, intuitively, you not only know this but you appreciate this as well. You accept your role in making sure the rose continues to get what it needs like water and sunlight (Yang) while enjoying the blooming process and maybe even stopping to smell them (Yin). Imagine how much easier things would be if you/we/everyone took this same approach in life. What if we incorporated the idea that there is a time for both action and patience, a time for movement and stillness. Let’s assume that you are presented with an opportunity. While it may feel right the moment you are faced with it, you decide to sleep on it (or meditate on it or pray on it) to see if it still feels the same way in a day or two (Yin). The amount of clarity that can come by giving this opportunity some space to grow and show a fuller expression of itself can be amazing. What you might learn is that your initial desire to take the job was nothing more than a fear-based reaction and not the right opportunity for you at all. Let’s assume that you are in meditation or taking a nice, long, relaxing run when all of a sudden and idea just pops into your head out of nowhere and then you find yourself serendipitously bumping into an individual who can make the necessary introductions at the right time that would set your new idea into motion. Bam! Now is the time to take action (Yang). 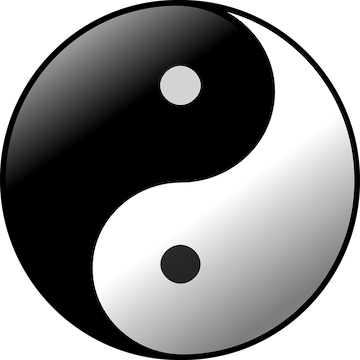 There is a delicate balance between Yin and Yang and both are equally important. Yes, it’s important to forge ahead (Yang) to grow your business but some of that growth is going to happen naturally and will unfold in time. Any good race car driver will tell you that there is an art to knowing when to let off that gas and when to go pedal-to-the-medal. If notes in a musical score are the Yang and the silence between the notes is Yin, you need both to have a melody — without the Yang it’s just silence and without the Yin it’s just noise.